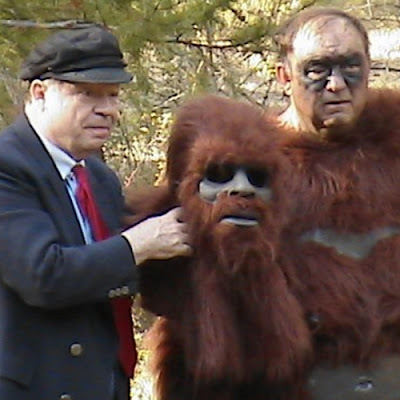 Fred Saluga heads the Fayette County Pennsylvania Bigfoot Research Project. While doing a presentation on August 8th 2015, he gained some attention from the local press. You can read an excerpt below where he expands on his suggestion that Bigfoots may not be from this planet. “They may be inter-dimensional beings,” Saluga said. He pointed to beings that disappear into thin air and Bigfoot trails that last for only a few feet. Saluga said that there have been many sightings over the years from the Republic area where he grew up. Another hot spot is in the Dunbar area. According to Saluga, the creatures have been reported for hundreds of years, as early as about 1500 A.D. and from every continent on the planet. Native Americans called Bigfoot “Sasque” (translated as “Don't know what it is”) or “Sasquatch” to the early settlers in North America. Some have suggested that the beings are alien transplants, shape shifters or creatures from another dimension. 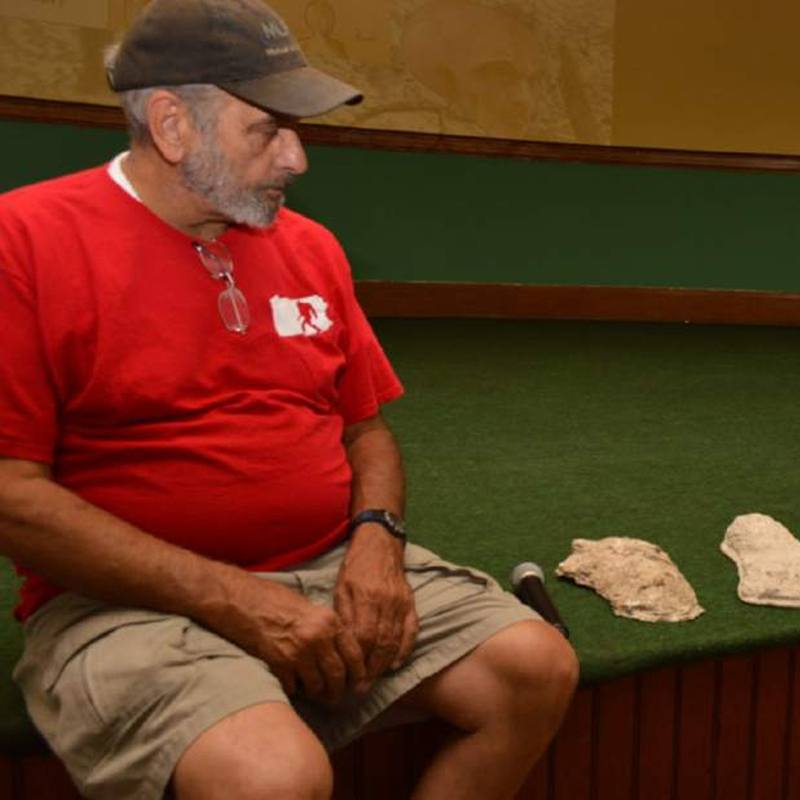 You can find out what else Fred Saluga and the Fayette County Pennsylvania Bigfoot Research Project has been up to at the links below. Dr. Matthew Johnson: I'm telling the truth about the SOHA portal. I define Dr. Matthew Johnson's Bigfoot chapters in three phases. The Encounter, Cloaking Revealed, and The Portal. Dr. Matthew Johnson's Bigfoot history begins at Oregon Caves National Park in Southern Oregon on July 1st 2000. You can read his a detailed BFRO report of his encounter. Here's the very short version. After exiting a cave, Dr. Johnson was with his family when he was alerted by a foul smell and loud vocalizations. After walking away from his family to take care of "business" he scanned downhill towards them and saw a Bigfoot. If you have ever heard Dr. Johnson recall this story in person, he gets very emotional at this point. This is the point where he expresses his concern for his family's safety. The encounter was huge bigfoot news for the mainstream media and went viral, probably because of the embedded irony that Dr. Matthew Johnson was a psychologist telling a story that sounds nuts to the general public. He went on to do several national media interviews and kept to this non-paranormal version. Fast-forward to 11 years later when Dr. Johnson had a conversation with only four people present. The conversation would be a milestone in the retelling of the Oregon Cave encounter. Dr. Johnson was a guest speaker at Toby Johnson's (no relation) Sasquatch Symposium. Paranormal researcher Thom Powell was also in attendance as another guest speaker. A conversation between the two of them would reveal a huge detail missing from Dr. Johnson's retelling of his Oregon Cave encounter. The missing detail? 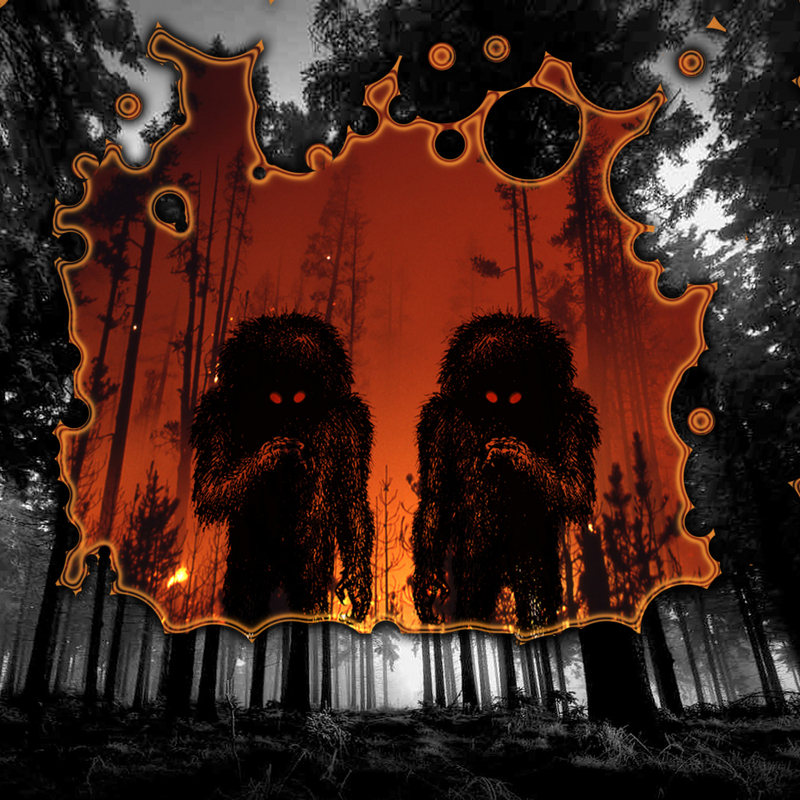 The Bigfoot in Matthew Johnson's encounter had the ability to cloak. After years of keeping his Southern Oregon Habituation Area (SOHA) to himself, Dr. Matthew Johnson began to invite hand-picked researchers to his bigfoot habituation site. In June of 2014, Adam Davies and John Carlson were among the exclusive researchers allowed to camp at SOHA and what they encountered still defies explanation, although Dr. Matthew Johnson tried at his conference. At the conference Dr. Johnson talked about visible portals to other dimensions and half-sized bigfoots with glowing eyes. The audio clip below is Bigfoot news and goes at a quick pace and is worth listening too. 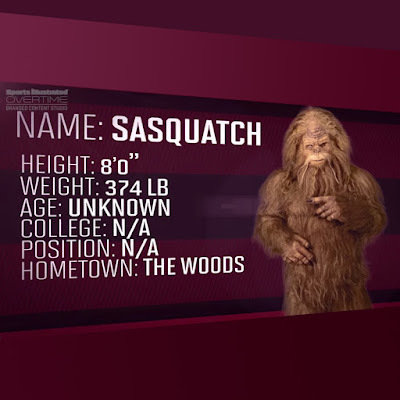 In the latest Bigfoot news Jack Link's has teamed up with Sports Illustrated to create same hilarious co-branded videos. There are a total of four videos so far. Scroll down and check them all out. He's traded in the forest for the field – football field, that is. He's oozing with potential (among other things), and he doesn't know the meaning of the word "quit," or any other word for that matter. 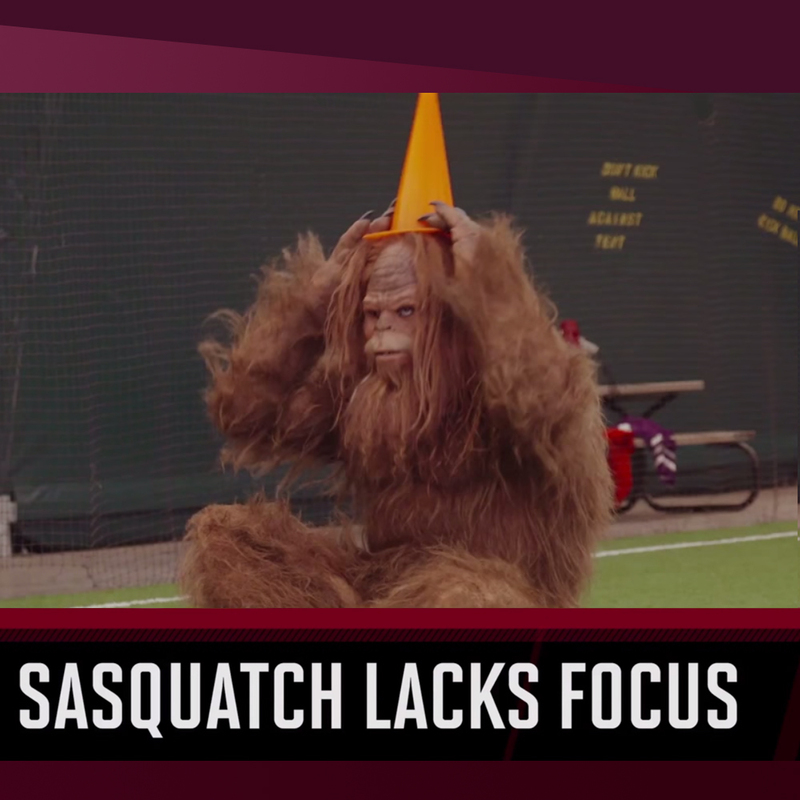 Watch to see why Sasquatch is the WILD player we need in our football lives. Sasquatch has seriously WILD skills, but can he be trained? Can the staff find a big enough helmet? And will he ever stop trying to chew on the football? Does he think it's a big brown egg? Check out Sasquatch as he takes the field for the first time ever. Watch Sasquatch try to work his way through football drills and find his WILDEST position on the field. 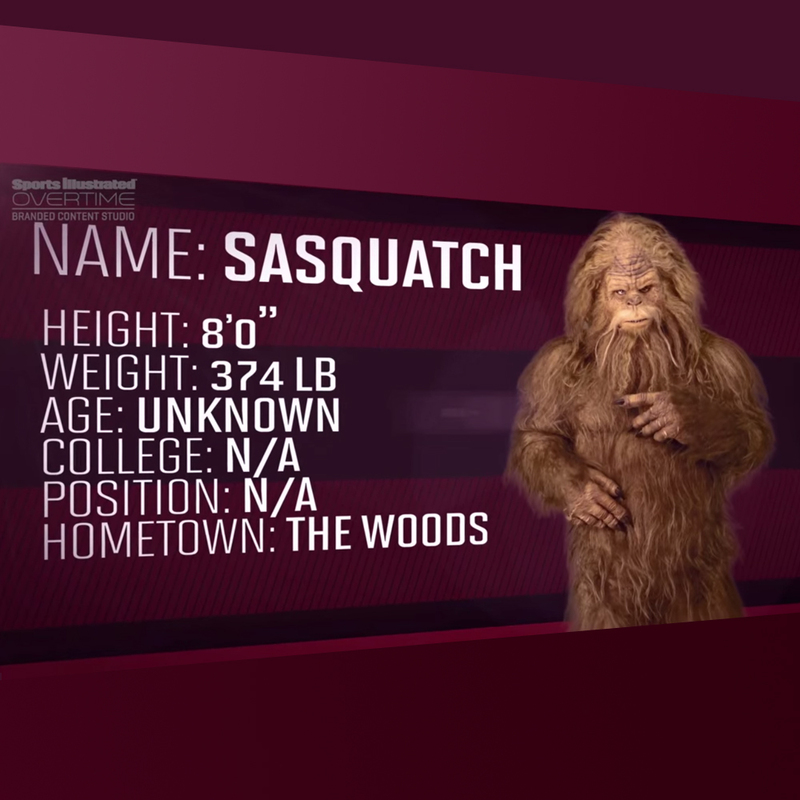 Sasquatch may not have much in the way of skills, but he's definitely good at one thing: hitting offensive players. Hard. In an article for MysteriousUniverse.org, Micah Hanks revisits the Patterson/Gimlin film after a new stabilization is offered on Reddit. The thread on Reddit uses the new stabilization to argue the weakness of the P/G film as evidence. While Mr. Hanks believes the snew stabilization does not offer anything new to either side of the argument, he does have issues of using the P/G Film as the Holy Grail of Bigfoot evidence. His issues with the film are mostly based on John Napiers concerns with Patty's Anatomy (for those uninitiated, Patty is the name affectionately given to the subject in the P/G film), Read one of Napier's arguments presented by Mr. Hanks below. For starters, the creature displays a sagittal crest atop it’s skull; however, the subject also, rather famously, appears to possess female mammary glands (breasts). Among the great apes, we have the sagittal formation that occasionally appears, primarily among the male members of the species (gorillas and orangutans), rather the females. Hence, it seems rather out of place that the prominence on “Patty’s” head so greatly resembles a sagittal crest formation, since “she” would be the least likely of the sexes to possess this trait. Mr. Hanks also draws attention to Napier's critique of Patty's belly--or lack there of. The argument is if patty has a the diet that comes with a sagittal crest than she should also have the large intestinal track or belly that come with it. These arguments about Patty's anatomy can go back and forth forever. Which perhaps underlines Mr. Hanks premise. His final argument about mismatched data does get interesting. It would be interesting to see anybody take on this final argument of the mismatch of data. head over to the MysteriousUniverse.org website and read Micah Hanks entire article titled, "Maybe It’s Time We Forget About The Patterson Bigfoot Film". The video is 22 seconds long and is quite a distance from the subject. As usual it is small, blurry and hard to define. The Tampa Bay article claims the video is making the rounds on the internet, while, at the time of this blog post, the YouTube video has only racked up 300 views. 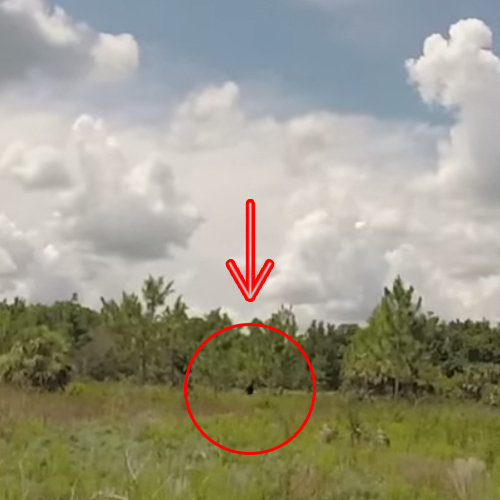 The video titled, "Skunkape Sighting Plant City," was published on June 5th of 2015 and the Tampa Bay article was published on August 12th of 2015. The video may get a boost after the published article, but the current low viewership may be due to the low quality of content of the video. Watch the video below and judge for yourself. Despite the video being "posted on a number of websites and Facebook pages that track sightings of bigfoot" as the bigfoot news article reports, two of the closest residence have not heard of the sighting. Read the excerpt below. A spokeswoman for the Hillsborough County Parks, Recreation and Parks Department said she hadn’t heard of any reports of bigfoot in any county park. Laurie Champion, a Pasco County resident who runs a website, www.pinellaspascoparanormal.com, that among other things tracks bigfoot sightings, said she hadn’t heard anything about the Plant City bigfoot. Click the following link to read the whole Tampa Tribune bigfoot news article titled, "Video depicts ‘bigfoot’ at Plant City area park." Meet Ron Morehead. The man with the most impressive Bigfoot Audio. 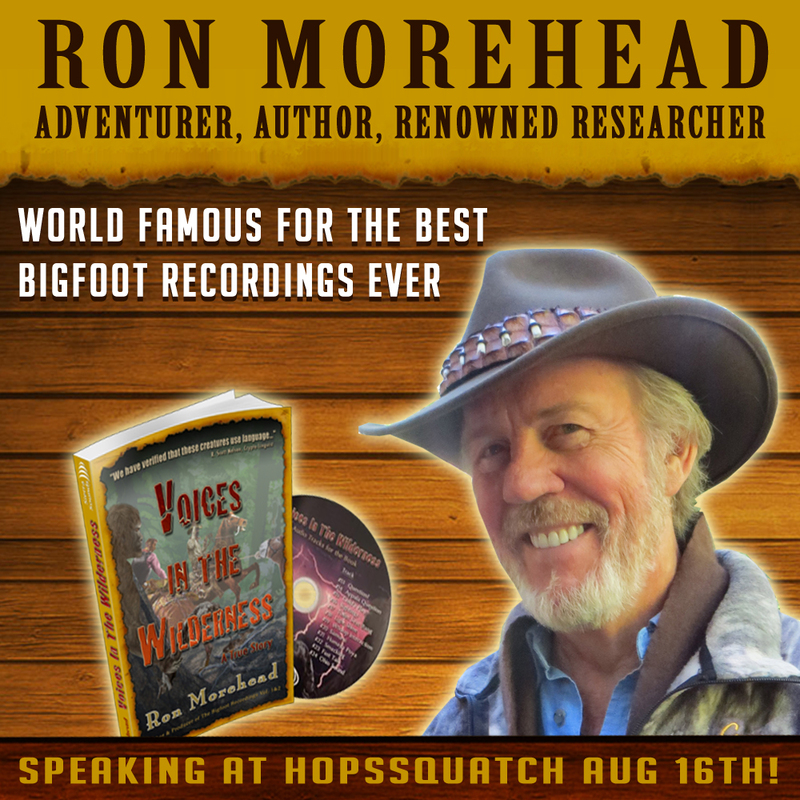 How did Ron Morehead get Sasquatch to come into his camp night after night and record their sounds and language? Ron reveals all (except the location) of his phenomenal recordings. Concluded to have no signs of being prerecorded or rerecorded by a PHD Electrical Engineer. Ron Morehead is an ‘adventurist’; a positive ‘someone’ who loves life, but often lives it on the edge. As a SCUBA diver, he swam with the hammerhead sharks, has been filmed in Mexico’s Pacific Ocean riding the backs of giant manta rays, and been a safety diver for the filming of Right whales in Patagonia. As a private pilot, Ron has flown his own aircraft from the Alaskan bush to the Costa Rican jungle. Besides travelling to the ancient Mayan civilizations in the Yucatan, he has also flown into a remote jungle area of Chiapas (Southern Mexico) on an anonymous Mayan discovery expedition. What he saw was thought to be one of the last remaining strong-holds of the Mayan people. He has ventured into Western Nepal’s Suklaphanta Wildlife Reserve to help assess the tiger population, explored the jungles of Bardiya on elephants, and been in the wilderness of Siberia looking for evidence of the Russian Yeti. He has made two trips in South America exploring the enigmatic structures and the non-human remains of the pre-Inca people. Over the years Ron has been interviewed by several radio programs and has been televised by the BBC and other learning channels. He was a guest speaker at the Darwin Museum in Moscow (Russia) and for years he has given presentations at symposiums and conferences about his Bigfoot/Sasquatch experiences. He has openly shared his knowledge and accounts with others. His book, “Voices in the Wilderness,” chronicles his 40 years of researching the enigma. 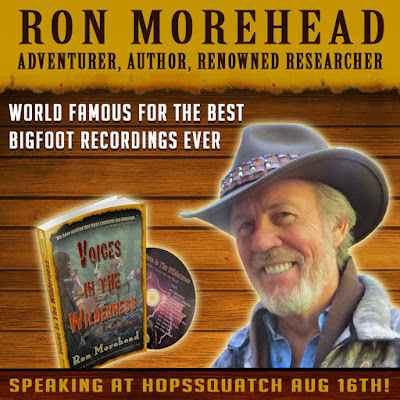 Besides his book, he has produced two CDs with actual Bigfoot vocalizations, focusing on the interaction he and others had with these forest giants.